Onsite Woodwork Corp. recently rearranged its entire shop to create a better production flow, free-up space and eliminate bottlenecks. The plant has continued to meet manufacturing deadlines while the move was taking place due to a detailed moving and production schedule. If moving five times in less than 20 years sounds like a headache, imagine pushing around edgebanders and point-to-point routers instead of furniture. Onsite Woodwork Corp. has done just that, and the company is now finishing its sixth shop rearrangement since 1990 in a quest for an efficient layout. During the current rearrangement, the plant has continued to meet manufacturing deadlines through a daily schedule that takes into account both production and the order equipment needs to be moved. Key production personnel planned the new layout through discussion and creating sample layouts with scaled machine templates. The new arrangement will increase and organize assembly areas, improve the efficiency of the veneer department, cut down on dead space and improve the production flow, Peterson says. The idea for the latest arrangement began about two years ago. 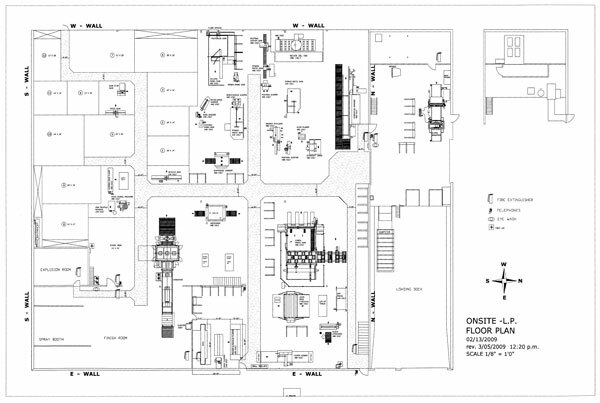 Onsite hired an architect to draw plans for 30,000 more square feet of shop space that the company thought it needed. He adds that the company was not just looking to free up space. Onsite is also moving equipment to continue its progression in the lean manufacturing process, which the shop began about two and a half years earlier. The company then purchased a Venjakob flat panel-finishing machine in August 2008, which took up a big piece of the shop floor. âWhen we bought the Venjakob last August, we knew we had to do something,â Peterson says. The company took a few redundant machines out of service to make room for the new machine, including an edgebander and double-end tenoner. The equipment is currently in storage until the company decides to add more physical shop space. The top blueprint is the shop's layout before the move, and the second blueprint is the new, more efficient arrangement. Shift supervisors, key shop personnel and the vice president of manufacturing began about three months of off-and-on meetings to plan the new layout, Peterson says. Meetings included plenty of debate and discussion about improving the flow for the veneer, machining and assembly areas. Peterson and maintenance personnel first moved the companyâs wrapping machine from the main shop floor into the loading dock after clearing space for it, he says. To make space for the wrapping machine, racks to store finished products were reduced, which created another constraint to encourage lean manufacturing. Onsite moved an edgebander from the middle of the shop to an area next to the north wall because the machine did not require much space behind it to run properly. It also pushed a CNC point-to-point router from the shopâs center to a spot against the west wall to reduce its profile and limit space for in-process projects. A big part of the job was changing all of the ductwork and electrical hook-ups to accomodate the new arrangement. The most complex part of the rearrangement, and the only step that could not be done in-house with the companyâs collection of forklifts and machine dollies, was rotating the companyâs XY Access Giben panel saw 90 degrees. The saw was the source of a bottleneck because it would cut panels faster than the shop could use them, causing parts to accumulate around the machine, says Herb Meldahl, who handled media relations at Onsite. The company decided to rotate the saw 90 degrees so trimmed panels could be fed directly into a newly established workflow aisle. Engineers from Giben had to disassemble the entire machine, and then reassemble it in its new position, Peterson says. âOne of the operatorâs talked to me yesterday and said, âYou know Ralph, I thought you guys were absolutely crazy when you talked about rotating this saw 90 degrees. But even after just working on it one day, I see the flow is going to be so much better,ââ Peterson says. Onsite also optimized its veneer area by giving the two clipping stations equal access to the companyâs end-clipper. All of these changes freed space to create a larger assembly area, which is also being reorganized.